While California is experiencing it’s fourth year of a severe drought, we here in Maritime Canada are not. It only rained twice last week – once for three days and once for four. The veggies and flowers and grass are loving it. However, this isn’t about that. This is about letting children be children. It’s about letting your inner child out to play every now and then. It’s about playing in the rain. 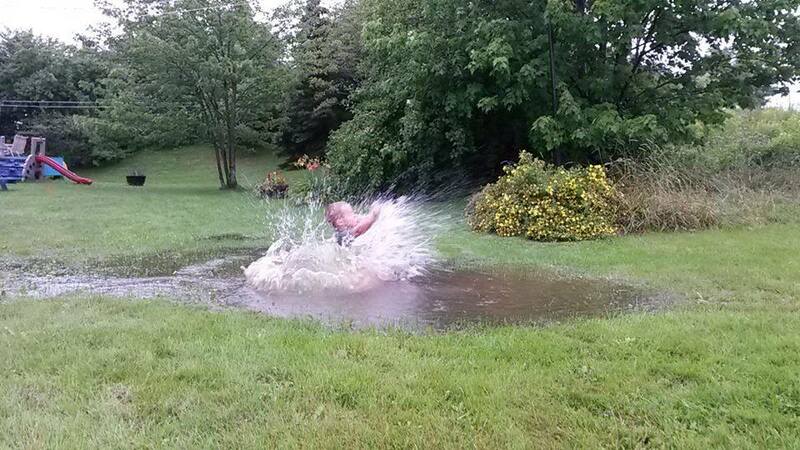 There’s not much that is as childish as playing in the rain. We’ve all been caught in the rain, of course. Needing to get to/from the car in a torrential downpour or you just happen to be outside when the heavens open up. But intentionally going outside while it is raining is sure to induce giddy laughter. Twice in the past week we have done just that. We splashed in the kiddie pool. We jumped on the trampoline. We set up the slip and slide on the hill. We splashed in puddles. We even had the neighbor’s kids join us. I’m thankful I am young (ish) and healthy (and childish) enough to run, jump and play with two rambunctious boys. The trampoline is assembled in the spring and taken down for winter. In between it sees use every day. It’s not as slippery in the rain as it appears to be. 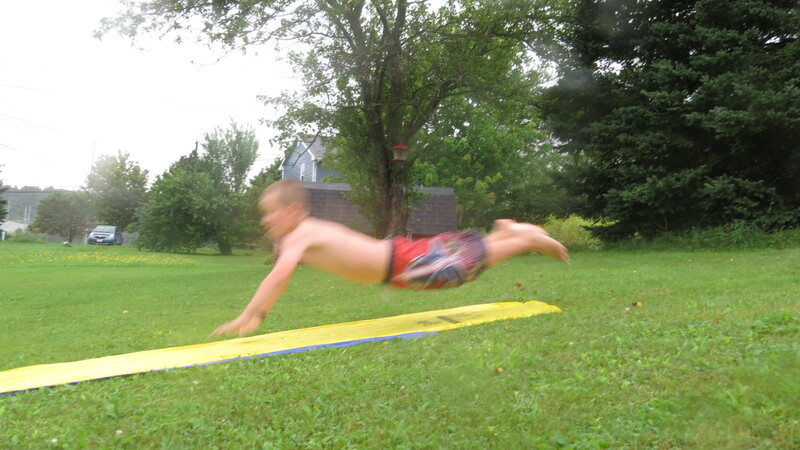 The slip and slide is self watered when it rains. It makes for some fun photos, too. 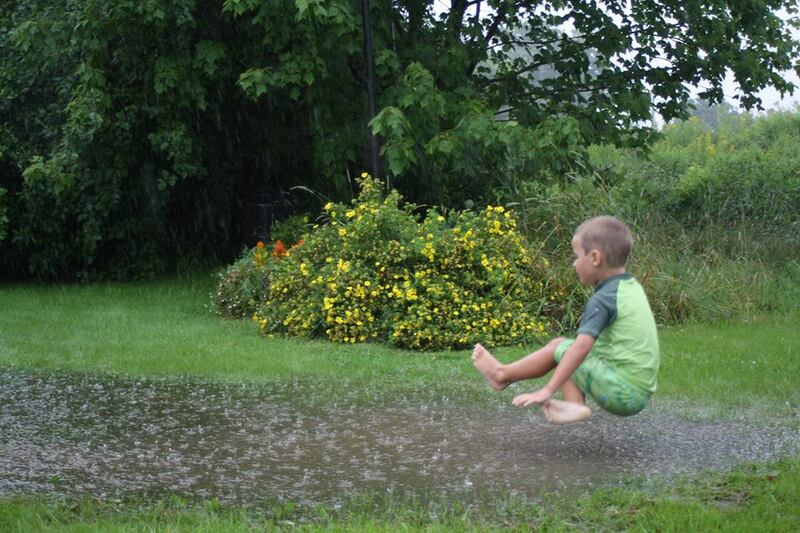 As does puddle jumping. Just take a look! So, in conclusion, rain doesn’t just make the veggies and flowers and the grass grow. It doesn’t just wash away the dirt and grime of the world. It washes away inhibitions, it helps the child (inner and outer) grow strong and healthy. Have you played with yours lately? 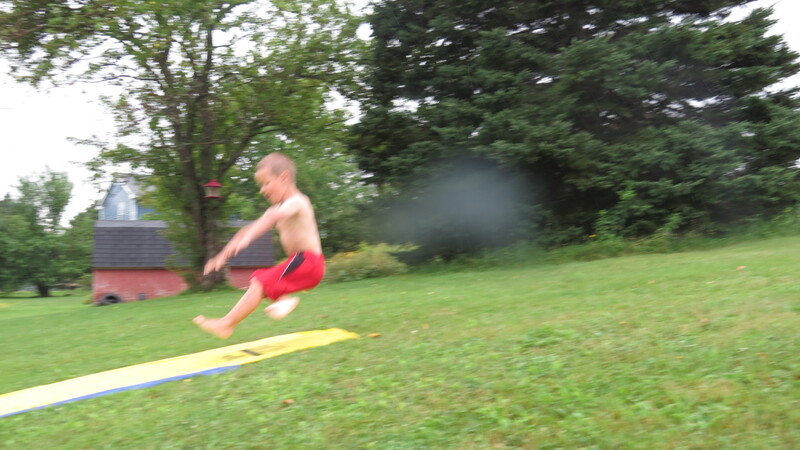 This entry was posted in Uncategorized and tagged Action Shots, Activities, Children, Inner Child, Outside, Puddle, Rain, Rainy Day, Slip-n-Slide, Splash, Trampoline, Water by stomperdad. Bookmark the permalink. That looks like some serious fun!